The Jack Garrett Band is the leading Live Music Wedding Band Entertainment in the Cincinnati Ohio, Columbus Ohio, Louisville Kentucky and Indianapolis Indiana area. With over 20 years of Entertainment Excellence and Featuring Cincinnati Ohio’s Top Wedding Musicians the Jack Garrett Band has consistently provided couples and clients with professional quality live music for wedding ceremonies, rehearsal dinners, cocktail hour, wedding receptions, corporate events, concerts and fundraisers. 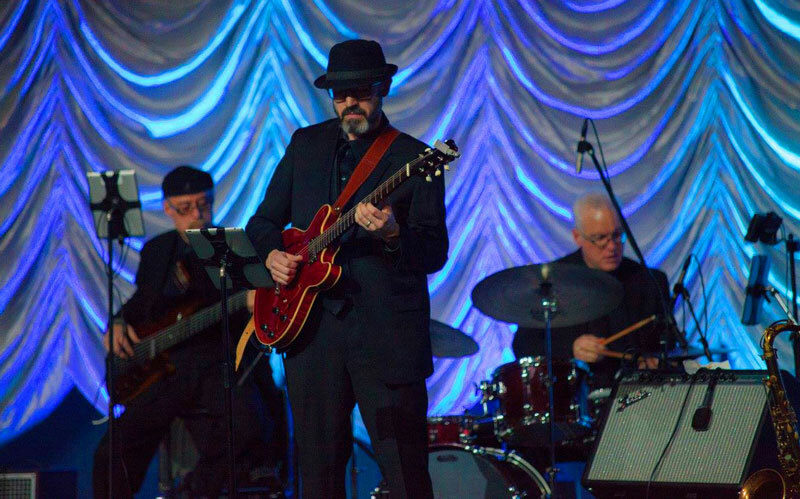 The Jack Garrett Band is the perfect choice for Columbus Ohio Wedding Reception Entertainment, A Louisville Kentucky Wedding Reception Band or a Dayton Ohio Wedding Dance Band. 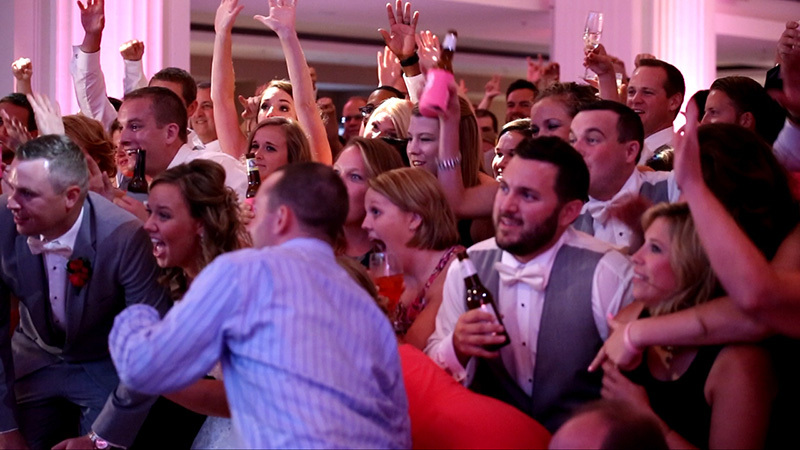 The Jack Garrett Band performs more variety of live music styles than any other Wedding Band in the Tri-State area. For Wedding Receptions, our full-time professional musicians are configured in either a 7 Piece Wedding Band or our most popular group the 12 Piece Wedding Band which includes a 6 Piece Horn Section. The Jack Garrett Band can perform Top 40 Pop, Soul, Motown, Funk, Salsa, Big Band, Swing, Latin, Classic Rock, Rhythm and Blues, Jazz and Country. This Award-Winning Wedding Band has been Voted Year after Year by brides on The Knot as The Best Cincinnati Wedding Band in 2010, 2011, 2012, 2013, 2014, 2015, 2016, 2017, 2018 and 2019! 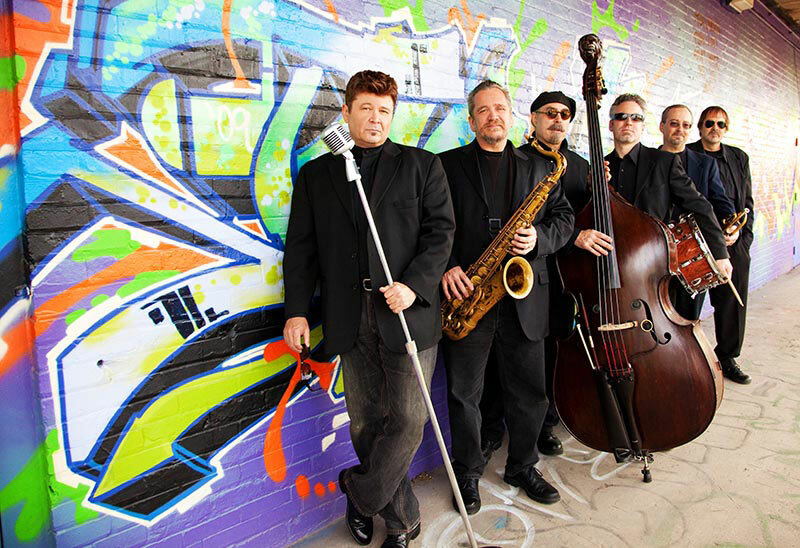 The Jack Garrett Band is one of only a few wedding bands to be awarded The Knot’s “Vendor Hall of Fame Award”! 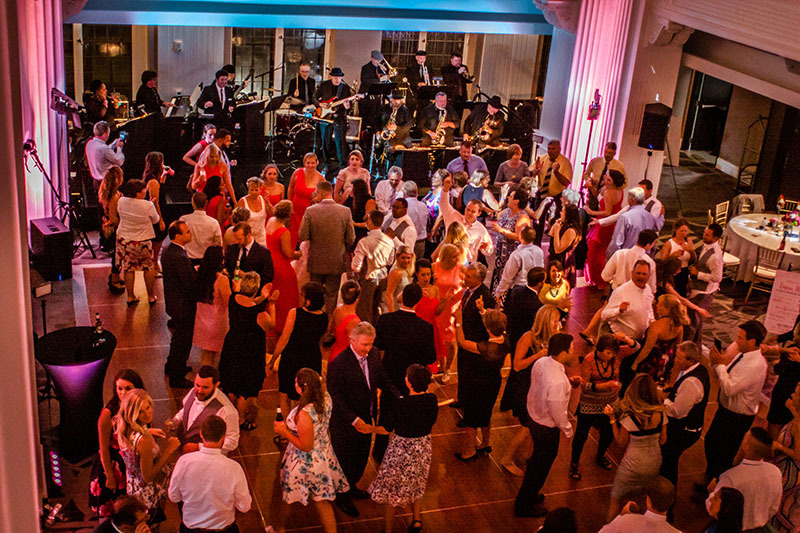 Our Cincinnati Wedding Reception Dance Bands will Pack the Dance Floor and satisfy all age groups at your wedding reception or event. 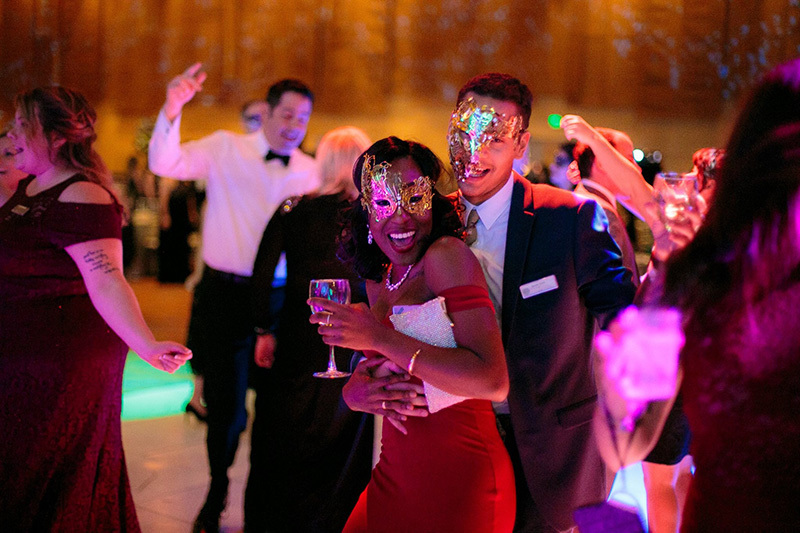 We will keep your guests dancing and entertained. Jack Garrett Band Videos are not “Staged” or “Studio” produced videos. The Videos were Recorded Live. The musicians you see and hear on these Audio - Video Samples are the musicians that will perform at your event. It is advised that you use head phones for optimal listening Quality and Enjoyment. The Jack Garrett Band provides the very best in Classic and Contemporary wedding reception dance music. 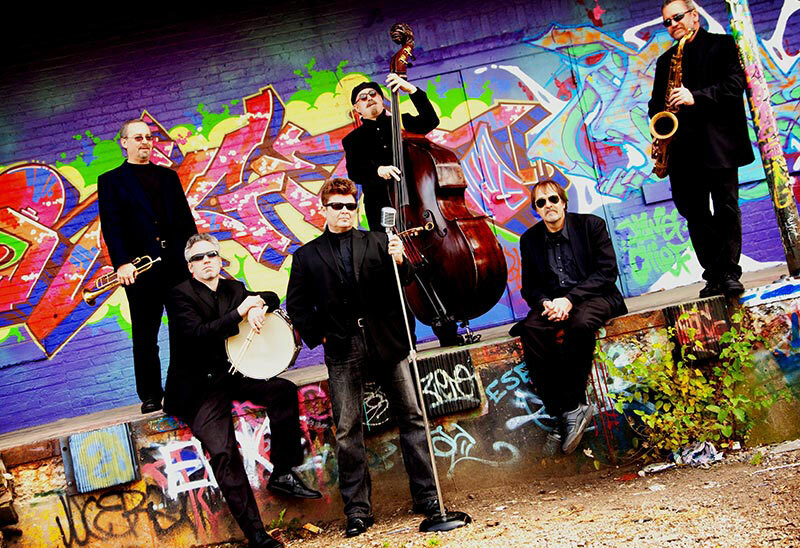 The Jack Garrett Band is a true variety wedding dance band. Absolutely perfect for wedding receptions where dancing is desired. 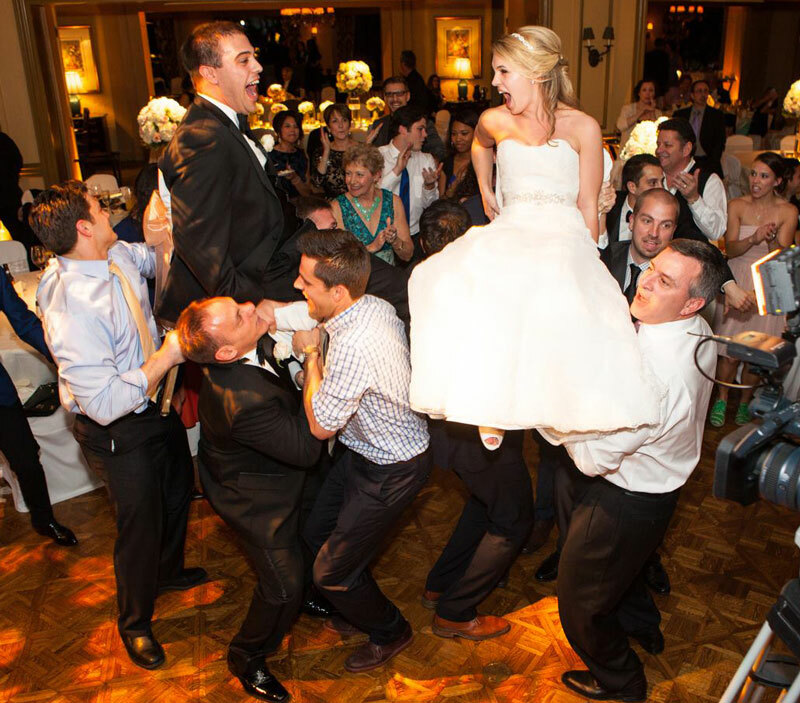 Our Cincinnati wedding bands perform so many different styles of wedding band dance music that it is difficult to categorize us. We are far from one dimensional! The bands repertoire and diverse instrumentation is unique in the wedding industry. The 7 Piece Wedding Band and the 12 Piece Wedding band will provide your guests with an ever-changing mix of music styles. Jack Garrett’s Cincinnati wedding entertainment acts will sound fabulous at your wedding reception or event. The wedding musicians that make up The Jack Garrett Band are some of the finest, degreed career musicians in the Midwest. We can perform almost any style of wedding reception dance music. Feel free to contact us if you have questions about songs or if you need help with wedding music ideas. The audio samples listed above are just a few of the styles of popular wedding band dance music that we offer. You can be sure that anything we perform at your event will sound fabulous! Take the time and listen to our audio samples on this page. We pride ourselves on giving our valued customers the best musical experience as possible and love to hear feedback. 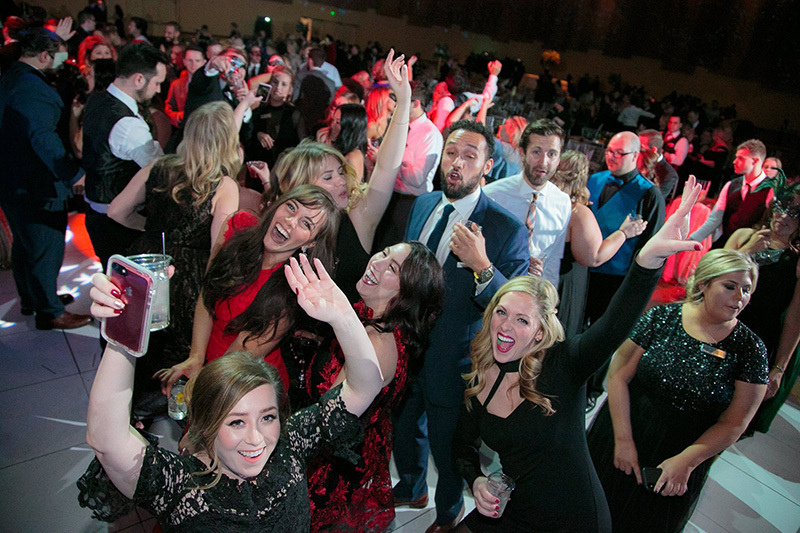 We welcome your comments and enjoy helping you achieve the ultimate party experience for all your guests. Thanks Jack for letting me sing a few tunes to my beautiful bride. Your band kicked it! Our wedding was a blast thanks to Jack Garrett and his awesome band! It was one night to remember! It's always a party when Jack Garrett's band plays! We danced all night at my best friends birthday party! JG Band was awesome! There's nothing more fun than hangin' with the family and partying with Jack's band! Party, party, party! Great night with the Jack Garrett band. We'll be at the next one too! My girls and I had a wonderful time at my cousin's wedding. Jack Garrett band was soooo goood! We never sat down! From the first tune to the last one of the night, we boogied til the lights came on. Jack Garrett and his great band really showed their abilities to swing a crowd. My wedding couldn't have been better because of Jack's awesome band. I will always remember the special songs he sang at my receptions! It was time to party and we did just that! Thanks Jack! You guys are dynamite musicians. Every song was amazing! We sang along with all of them! Our wedding reception was a blast thanks to Jack Garrett and his amazing band! Rock on! Thanks Jack for providing the best dance music we could ask for at our wedding reception. Your professionalism and talent showed! Best band in the 4 state area. Jack Garrett and his band are one of the best bands in the Cincinnati area. Great songs, great arrangements, great singers! Jack Garrett rocks! Our reception was fantastic 'cause of him! My husband and I loved the Jack Garrett band at our wedding reception. They also played during dinner and happy hour. Tailoring your event's song list is important to us and we welcome your input. Performing live is our business and we're very adaptable to cocktail, dinner and dance musical arrangements. Staying current with trending music is also important to us and we appreciate your input when arranging your event's song list. WHAT TYPE OF EVENTS ARE YOU AVAILABLE FOR? Jack Garrett Band specializes in wedding ceremonies, wedding receptions, corporate events, galas, fundraisers, country club events, concerts and parties. We perform at any event where high quality musical entertainment is required. HOW MANY PIECES ARE IN THE BAND? ARE YOU AVAILABLE AS A SMALLER 4 – 6 PIECE GROUP? Yes…. but not for wedding receptions. It really wouldn’t be the same product with a smaller configuration. Four piece bands are very limited musically when it comes to their sound. Everything will sound the same after an hour. We prefer a fuller, more authentic sound that is truer to the original song recording. Beware of groups that offer themselves in many configurations such as a 3 to 13 piece group, as these are most likely out of state agencies that may simply have a database of musicians from your area that they piece together to suit any size desired. The Jack Garrett Band is a set group and always the same highly talented and very specialized performers as seen in our Recorded Live Video Demos. Most of the Out of State Agency Bands do not provide Videos on their websites. The Music on their websites were not recorded by the musicians you will have perform at your event. Don’t be fooled by this. Agency bands that have showcases never guarantee that you will get the musicians that you see. There is a great benefit to having a solid group of the same performers in that these types of groups are much more polished and rehearsed than groups that are simply pieced together. For our clients this means seamless non-stop transitions in-between songs, as well as a much higher caliber performance musically as well as visually. HOW MUCH SPACE OR SIZE STAGE DO YOU REQUIRE? We can work very comfortably on a stage 12′ to 14’ deep by 24′ to 28’ wide. This is a very typical size stage or space for even the 12-piece band. If the room allows, a larger stage of 16’ x 32’ is optimal as it gives our performers more room to move around. The 7 Piece Band works well with a 12’ by 20’ space. Both bands can work in smaller spaces, this can be negotiated. Our thinking is to make sure there is plenty of space for the dance floor and to not overwhelm the room with a huge stage. We can also work without a stage, and in some venues this is just fine, maybe even preferable. Having a stage typically does make for a better look and allows all of the guests to easily view the band when the dance floor is packed. We require a minimum of two separate 15 to 20 amp circuits to the stage area and for the band only. This is your typical house type power, but on two separate breakers and not shared by other items. Many venues have the power in place and nicely labeled, other venues (especially venues with moveable walls), don’t have any power, and require what is known as a power drop box. The power drop box is always the preferred power choice when available. We require the power for band use only as other items such as small lighting can create buzzing sounds in the sound system, or worse yet, cause the power to blow. WILL A 7 TO 12-PIECE BAND BE TOO LOUD FOR MY EVENT? Excessive volume is not necessarily a product of the size of the band, for instance some of the loudest bands in history were four and five-piece groups! We have our sound and volume in check and use some of the most expensive high-end and high tech equipment available in order to keep our sound volume consistent. Unless otherwise instructed, we always dress formally in modern suits, ties, or jackets, with our female vocalists in appropriate attire. For corporate events we dress for fun, while still being formal. We are often asked to dress similar to the look in some of our videos. Jack Garrett Band covers a wide variety of music that can include Big Band, Swing, Motown, R&B, Soul, Funk, Rock, Top 40, Country as well as today’s current hits. We really enjoy performing all styles of music. 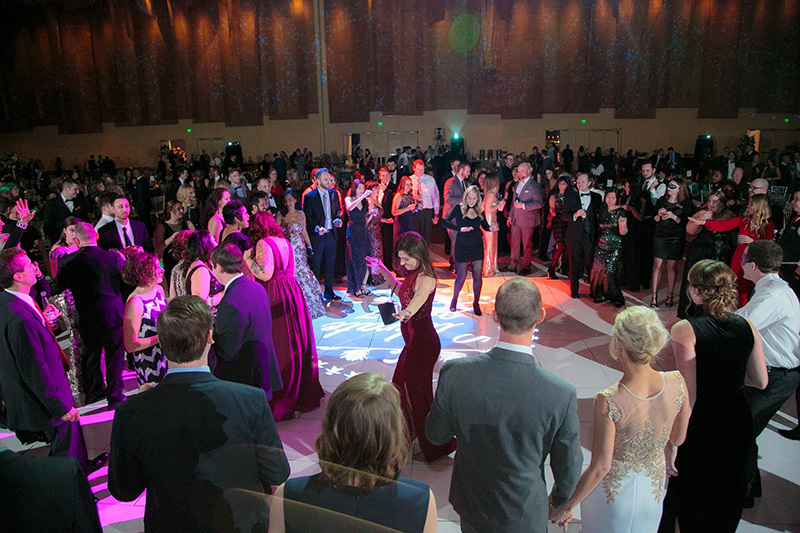 Our primary focus is on the fun well known dance hits that will energize your event. CAN I HAVE INPUT ON THE SONG LIST? Of course! We have two meetings with every client. A Timeline – Detail meeting and a Music Meeting. We ask that our clients simply highlight an appropriate number of likes from our song list that we provide you while crossing off just a small handful of “do not plays” (even if requested by one of your guests). The highlighted list along with some general information is all we need. This allows us the flexibility we need to create the amazing parties we are known for. CAN YOU LEARN A SPECIAL SONG FOR MY EVENT? Yes, For Wedding Receptions we can typically perform two or three songs for any given event including the First Dance, Father – Daughter Dance and the Mother – Son Dance. We are professional full time musicians that read music…..We do not “LEARN” songs like the semi pro bands do. We have a custom written arrangement for any song that is not currently in our repertoire. We will need new song requests at least two months in advance of the performance date. Most events include a Soloist or Duo Performers for a one-hour cocktail, and the band for four-hours. Wedding Reception quotes are based on 5 Hours. We perform Cocktail Music, Dinner Music and Dance Music in between your formalities. 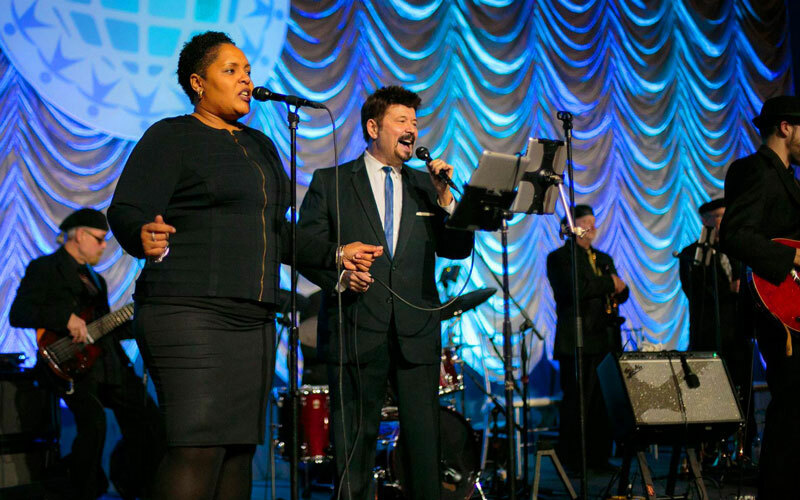 Many of our corporate events include the band for a two or three-hour continuous performance. We are always available for optional overtime as well. Jack Garrett Band is based out of Cincinnati, Ohio and considers Dayton Ohio, Columbus Ohio, Louisville Kentucky and Lexington Kentucky and Indianapolis Indiana to be our regular travel areas. Additional travel fees may be incurred for locations outside of this radius. ARE YOU AVAILABLE OUTSIDE OF OHIO? Yes, we are available and have performed in many areas within the US and are available to travel coast to coast. DO YOU OFFER MUSIC FOR THE COCKTAIL HOUR? Yes, we can offer our Guitarist for the cocktail hour or our Pianist if a piano is available. Other musicians are available such as a Jazz Trio or Tenor Saxophone and Upright String Bass Duo. Our musicians perform instrumental Jazz Standards, Latin and Smooth Jazz background music as is often desired for the cocktail hour. We can also assist in securing specialized acts for cocktail hours. DO YOU OFFER MUSIC FOR THE CEREMONY? DO YOU OFFER EMCEE SERVICE? DO YOU OFFER A WIRELESS MICROPHONE FOR TOASTS AND SPEECHES? Yes, During the Wedding Reception or Event At No Extra Cost. We accept Checks, PayPal or Direct Deposits Only. WHEN DO YOU ARRIVE ON LOCATION FOR SET UP? Our set up crew like to arrive with the bulk of our equipment as early as possible but always at least four hours in advance of the bands start time. We can work with shorter set up times as long as it is discussed before a contract is signed. We typically set up in less than 3 hours, and then have some down time to rest up in advance of the show. Other members such as the Keyboardist, Drummer, Bassist, and Guitarist arrive one hour prior to the start time unless they are members of the cocktail hour crew, Vocalists and Horn players arrive one hour prior to the event start time. This seems obvious enough and typically isn’t an issue, however we have encountered venues where the entire room is blocked off, or the stage is packed with chairs, tables, as well as other vendor’s items. This usually occurs only when the ceremony is taking place in a portion of the same ballroom, and then the venue is turning over the room in order to use the ceremony area once the ceremony is over. This is just fine, as long as they have our stage in place and we have access to the stage to set up. Please let us know before a contract is signed if there is a “Room Flip”. Give us a little info and we'll give you a night to remember! Our booking agents are ready to help with all the details. Our prices are competitive and adjustable to any budget.